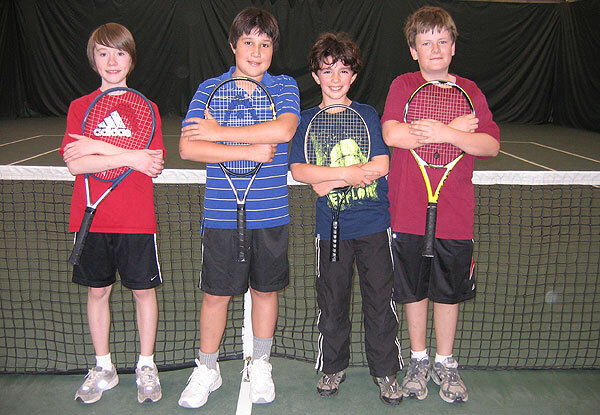 We have many clinics and many junior programs for everyone from beginnining to advanced. Call Jill Gerrain for game arranging and Eli for lessons and classes. Eli Armstrong is our wonderful head pro. He's been with us for seven years. Eli played Davis Cup for his country. He's a fantastic teacher and fantastic player. His students have awarded him five stars. Read more. 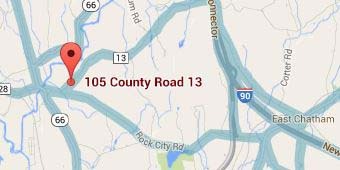 + We have three courts -- two hard and one Har-Tru. 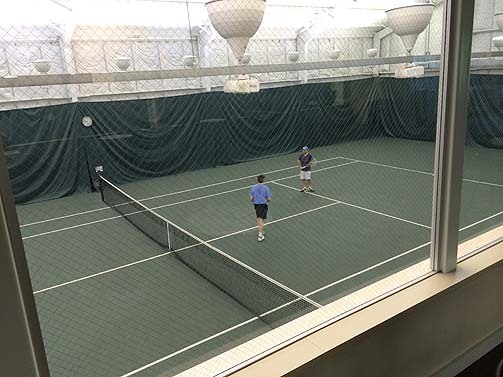 + Our three courts are self-contained. No balls or noise from neighboring courts. + We just put in new, much brighter lighting. You've never seen courts so well lit. + We have group lessons, clinics. junior development at all levels. + Everyone loves Eli, our head pro. He is patient, sweet and a great player. Take a clinic or a lesson with Eli. Your game will improve; you'll feel on top of the world. + We do game arranging. We have players at all levels. + Our staff is super friendly. Jill Gerrain is the manager. Eli Armstrong is the head pro. + Our long hours. We're open early morning to late evening. + Our low prices. We have contract time and hourly play. Play before work. Play after. + We love our juniors. They can now play open court time for only $10 an hour. 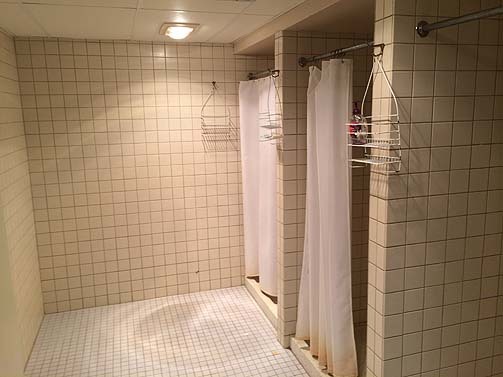 + We have large men's and women's locker rooms with hot showers and, free Wi-Fi. Bring your laptop, iPhone, Android. Make sure you turn on Wi-Fi Calling. 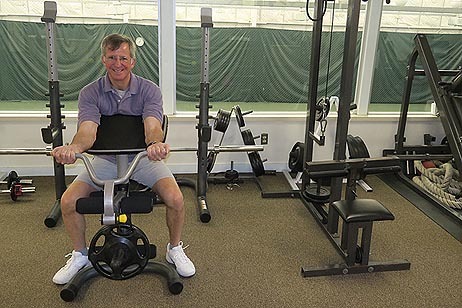 + We have a great gym with oodles of machines and the best on-site trainer, Jay Thorn. See below. 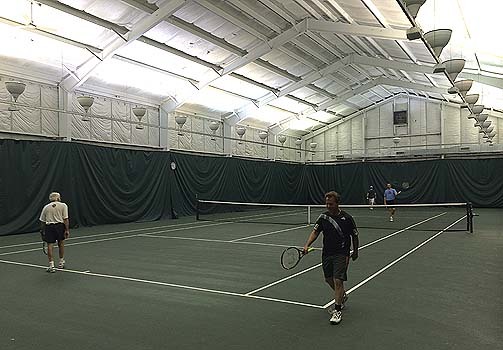 The Old Chatham Tennis Club has three courts -- two hard and one Har-Tru -- under a metal roof, heated during winter and offering year-round glorious tennis. Arrange a lesson with Eli by calling or texting him on his cell 518-779-7663. 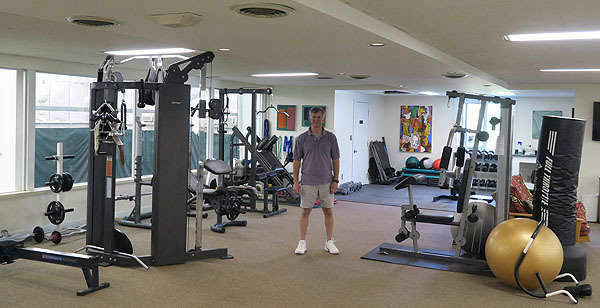 Upstairs you'll find a well-equipped gym which is free to our members. We have a treadmill, a rowing machine, a functional cable trainer, a utility bench with squat rack, a lat machine (for working your back), a hack squat machine for developing your legs, a pilates machine (full body fitness machine), step aerobic boxes, a stationary bike, stability balls, jump ropes, bands, kettle bells, battle ropes, yoga mats, all manner of weights, a full rack of dumb bells (from 5lbs to 50lbs), a kick boxing dummy, a stair stepper, stability balls, medicine balls and a wonderful trainer, called Jay Thorn. He tells us he "got out of business eight years ago to do something useful" -- namely train people to live longer, healthier, happier lives. He specializes in people over 50. He recommends two or three training sessions a week. But he has students who do once a week "with homework." Jay is talented. He ran the Boston Marathon one year in 2 hours 58 minutes. He has completed many personal training courses. He's the real McCoy. Better yet, he's popular with our members. Jay Thorn's email is JayThorn@Fairpoint.net. His phone number is 518-965-4497. Subscribe to our free club email. We'll tell you what classes and courts are available and when. We will not share your email address with anyone. Promise. The BIG news is that juniors can now play any time there are open courts. And that open court junior time is only $10 an hour -- about the cost of an hour of electricity for the lights. We really want to encourage our young players. We want them all to receive tennis scholarships to the best colleges. 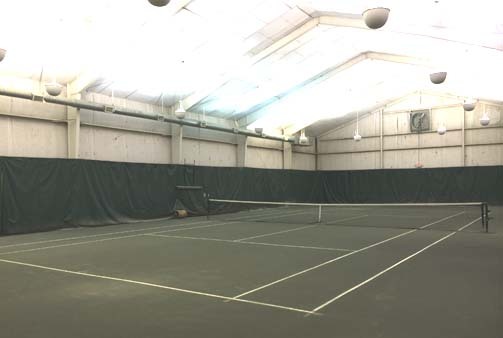 The second BIG news is that we replaced all the lighting on all three courts with much brighter LED bulbs. We also added four more fixtures to the Har-Tru court. The "soft" court is now as bright as the two hard courts. There are huge advantages in LED lights. First, they're stay consistently bright. They don't burn down and become dim and pink/yellow. Second, they turn on instantly. You can turn them on at 9:00 AM and start playing at 9:00 AM. Third, they're much, much quieter. You actually won't hear them on the Har-Tru court. Some of us can't even hear them on the hard courts, either. That's an age thing! THE POPULAR FRIDAY NIGHT SPECIAL HAS BEEN EXTENDED TO SATURDAY NIGHTS: 4-10pm Fridays and Saturdays. $25/hour court time. NON MEMBERS welcome. NEW DISCOUNT ON CONTRACTS: This season we are offering 15% to 25% discounts on contract times. That is much bigger than any time in the history of the tennis club. Guaranteed court time each week and save money, what could be better? We open Monday September 17, 2018 and close Sunday May 19. There are no contracts on Thanksgiving, Christmas and New Years Day. The price on the contract reflects that. We are closed on Christmas and New Year's Day, although "special arrangements" can be made. Jeff Bloomberg specializes in teaching coached sessions on the ins and outs of how to win a match. To book time with him call 794-8117 or email at krystaljo@hotmail.com. THE HAR-TRU COURT IS PLAYING VERY WELL. It has taken years. But we'll now pit our "soft" court against any other one anywhere in the world. Our court is world-class. Try it. By the way, Putnam Tennis comes in and resurfaces our Har-Tru court every September. 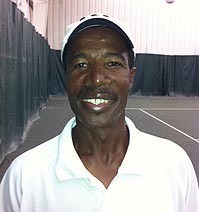 STAY ON TOP OF BREAKING CLUB NEWS: If you haven't already, go to www.oldchathamtennis.com and sign up to receive our emails. Or send Jill an email and ask her to add you to our mailing list. You will receive updates on open court time, drills, lessons, junior development and other club news -- like when there's a blizzard and the club is closed. No one else has access to our mailing list, so you won't receive any spam. OUR OVERWHELMING IMPRESSION: We're super flexible. 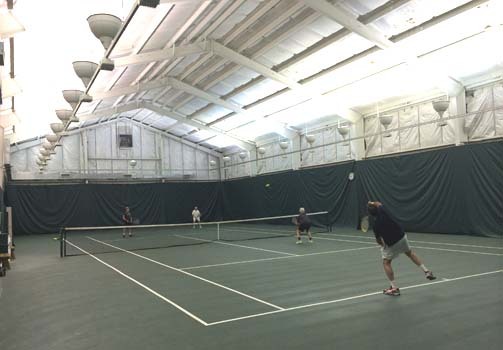 We have private lessons, group lessons, clinics, game arranging - whatever way you want to play tennis. Let us know. We love tennis. We want you to love it also. Court 3. Har-Tru surface. Similar to clay,except it's green. View from above (where the gym is) onto Court 1. There's also the same windows and view onto Court 2. Upstairs is a great place to watch the best tennis. The lobby has a desk, steps going upstairs, entrance into Court 1 and art work from a local painter. 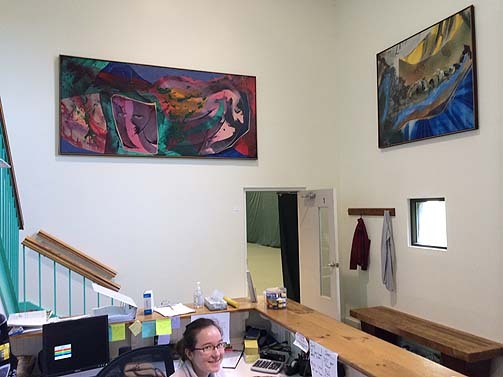 We often feature exhibits of art from local artists. 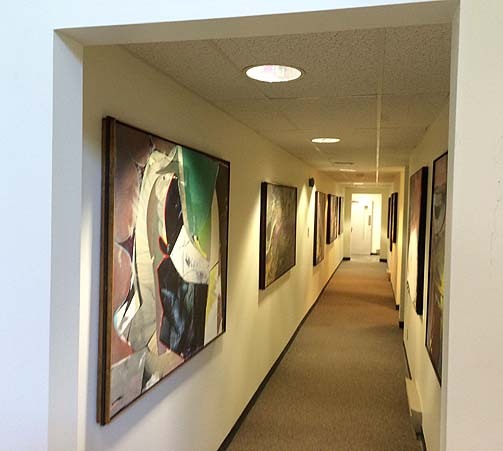 Hall featuring art exhibits by local artists. 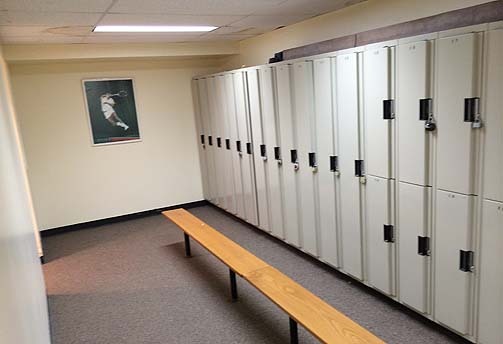 Men's locker room. Plenty of lockers. Proud graduates of our Teaching Programs, most of whom are now older. Note to file: would someone give Harry some new photos of our kids.